Testosterone and Cancer! Hormones & Prostate Cancer in Men! Hormones & Prostate Cancer in Men! I have been unable to find any solid evidence that supplementing to increase testosterone into normal ranges increases the risk of cancer. In fact, it appears that failure to treat low testosterone, may actually increase the risk. In his book, Testosterone for Life, Harvard Doctor, Abraham Morgentaler, wrote..
"Early in this century, Dr. Charles Huggins' Nobel prize winning experiments showed that castration or injection of estrogen can cure or prevent prostate cancer. Since that time, the standard education of medicine has been that testosterone is bad for the prostate. Therefore, male hormone replacement therapy can be risky. After over 65 years, recently, new scientific discoveries has shown just the opposite. Low blood levels of testosterone do not protect against prostate cancer, and actually may increase the risk. High testosterone level do not increase the risk of prostate cancer!" According to Robert Davis, MD, professor of urology at the University of Rochester, N.Y.
"One of the myths is that androgen supplementation will cause a cancer. We know that prostate cancer often regresses when androgen is removed, but there is very little evidence that supplementing to normal levels increases risk of cancer, and some evidence it may actually lower it." The Dangers of Low Testosterone! The lower a man's testosterone level, the higher his risk of death. Men with lower testosterone levels have an increased risk of dying from any cause, according to University of Cambridge gerontologist Kay Tee Khaw. According to his study done with nearly 12,000 men between 1993 to 1997, there is a strong link between low testosterone and early death. During the study period more than 800 men died. After looking at the testosterone levels of these men, here is what he found. I think the evidence is clear! If you are a man it's very important that you keep your testosteron levels up in the normal range. If you let your testosterone levels fall too low, you will increase your risk of premature death. 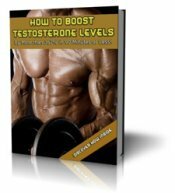 Fortunately, there is plenty of information on this site that will show you how to safely increase your testosterone levels naturally.